Venue phone: +48 884 891 734. Katya Barulova graduated with highest scores at the music high school in Kotel and achieved her master degree at the Music Academy in Plovdiv. proficiency in the specific Bulgarian folklore dialect, as well conducted hundreds of concerts in Bulgaria, Italy, Germany, Austria, USA, France, Poland… Katya Barulova has won a number of awards from prestigious competitions and festivals in Italy, Spain, Nederland, Costa Rica,Ireland and special awards from the Bulgarian Ministry of Culture and the Union of the Bulgarian composers. Stoyanka Andreeva– born and raised in the city of Plovdiv, Tanja studied economics before being employed by the Bulgarian State TV and Radio in Sofia. 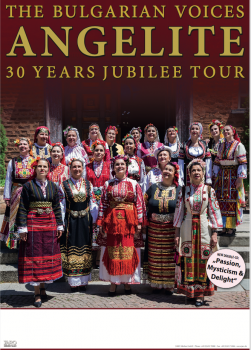 There she started her intensive involvement with Bulgarian music and especially with the famous Bulgarian female choirs. She helped to found Angelite and acts as its personnel manager, researcher, translator, tour manager and, when necessary, group psychologist. With great competence and professional expertise she pilots Angelite through the turbulent seas of the international music business.